Many people have pre-concieved ideas about Tarot...Psychics and Medium work! I hope this page answers some of your questions! You don't see your question answered here-Please feel free to email me and I will be happy to assist you! * "Isn't Tarot worshiping the devil"? In a word...No. Tarot and other forms of divination are actually time honored ways of meditation, of prayer and is practiced to this day in many religions. As a matter of fact, there are quite a few mentions of this in the Old Testament! I do not perform black or any form of 'magic' and am also not an 'Wiccan', not a witch, I do not cast 'spells'. I am just like your neighbor, sister or favorite Aunt...I just happen to be psychically & spiritually connected! * "I've heard of people who've lost their life savings to Tarot Readers and I'm scared." I would be too! As in all the world, there are good and bad people. So...How do you know if you reader is good? Get a recommendation! Ask a friend, read online testimonials! Professionals will have a nice website with their own domain name. Prices should be listed upfront and services described to your liking! NEVER give money to a person who insists that they can't help you, UNLESS you give them more money to perform a service or ritual. You're here for a reading, you should get a reading! * "I don't have PayPal, but want a reading, can I still get one?" Yes. I do accept payment via PayPal (you can pay in seconds online! ), but also accept cash payments in person, and credit cards (for a slight additional charge to offset the cost of what the bank charges me to accept your payment). * "Can you really predict the future with perfect accuracy?" No. And no one can. The future is made up of little decisions and circumstances that change second to second in our lives. Additionally, we ALL have free will and can choose to change our own destiny! What I can do is assist you in finding answers to your questions, to guide you in the direction that ultimately will affect your future in the most positive way...as it should be! ADDITIONALLY, every Sitter should be aware that Tarot is NOT an effective tool for giving DATES, so asking "When will I get that job" isn't as effective as asking "What should I do or know to put myself in the best position for getting my dream job!" * Can I have a Free "Sample" Reading? Sorry...no 'samples'! I find that those who want to 'test the waters' to see if we're a 'good fit' Psychically will benefit from a smaller Reading! 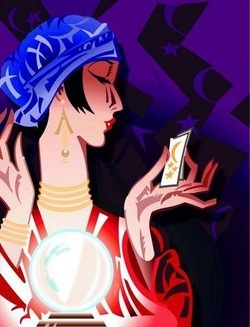 Don't be shy...try a "Quick Answer" reading to see if I am the right Psychic for you! * "My Readings with my 'usual' Psychic was kind of flat. What can I do to get the most out of my Readings with you?" What an AMAZING question! Thank you! The MOST important thing for EVERYONE to do to assure the BEST most accurate Tarot, Psychic, Medium or any other kind of reading is to be OPEN to the process! Clients to try to 'hide' things from their Reader are doing THEMSELVES a huge disservice! Playing "stump the Psychic" only frustrates the Reader, the Energies around YOU and YOU yourself! GIVE affirmation, give feedback, allow the energy and the reason you are there to to SHARED so you receive EVERY bit of information meant for you!!! * I was hoping to hear from my late Uncle during our Mediumship session, but he didn't come through...why? Spirits choose to come through or not come through at will. It's not like picking up a phone and placing a call! Sometimes the person you're hoping to hear from will appear, sometimes not, sometimes someone else will, sometimes no one at all. For the MOST satisfaction, you MUST be open to hearing the information being offered and keep your expectations in check. I am confident that the messages you receive are the ones you are meant to have! * Can I bring a friend to my Tarot Reading? It’s not recommended, but if you feel very uneasy about the process, you can bring a friend or loved one for support...however if something personal arises in your Reading, you may wish to excuse your friend! PLEASE NOTE...No more than one person may attend a Reiki Treatment or Chakra Balancing, Cord Cutting or other Energy Healing service. Medium Sessions have different guidelines. Please visit my Medium Sessions Page for more details. * Can you Read Tarot for some of my Party Guests & do a few Medium Readings too? Unfortunately, no. Psychic Readings and Medium Sessions differ greatly. I am able to do repeated, wonderful and accurate Psychic Readings (often using Tarot Cards) for up to 15 people at an event (about 5 Sitters per hour). Energetically speaking, after that, I am "spent"! Medium work requires a GREAT deal more preparation (long meditations before) and a huge amount of energy to convey these messages of love with accuracy. I can connect with the spiritual world for up to 2 hours...but no longer. I am NOT in control of what Spiritual energy comes through...so private Readings at parties often disappoint the "Sitter" because someone Else's energy can come through! Please keep this in mind when planning your next gathering! * Why Do I Need to give you advanced notice if I have to re-schedule or cancel an appointment? Just like any professional, I keep regular hours and have a limited number of appointments available to those wanting my services. When you cancel at the last minute, I can no longer book that time. Someone else in need has lost the ability to use my services and I have lost income. You may also be interested to know that my preparation for doing Readings requires preparing myself in meditation, as well as physically and metaphysically cleaning my studio space. This process can take up to an hour PER guest! Your cooperation in this regard is requested, and your respect is very much appreciated! * Can I make an appointment for my friend? I do NOT allow ‘2nd party’ appointments to be made. Group appointments are fine...but individual private appointments must be made by the sitter. * I had an excellent Visit! Can I give you a tip? Yes...thank you! All who provide a service to the public appreciate being tipped...in any amount. It is a lovely way to say 'thank you' for the service you've received. * What is your background? Take a look at this page. If you have a specific question about my qualifications...just ask! I am an open book!